The Custom Parka is a sleek, high-quality Parka perfect for keeping athletes warm between events, games, and before and after practices. 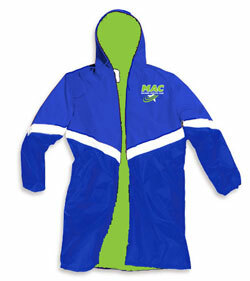 • Top color extends halfway down the back of the jacket and is cut straight across. • Fuzzy 19 oz. Arctic Fleece lining. • Durable, water repellent oxford nylon shell, reinforced seams. • Fully lined pockets and hood. – Embroidery: NONE. When you get it, contact Coach Kris Goodrich know, and she will get the MAC Logo and Your Name embroidered for you for an additional $10.